The “Quality Tourism Services Accreditation Scheme” adopts a holistic approach to evaluate the overall service quality of the participating merchants. The assessment consists of two parts, namely “Mystery Shopping Assessment” and “Service Management System Audit”, whereas the frontline service standard and management system will be assessed respectively. “Traveller Satisfaction Survey” is added to cope with the business nature of travel agencies that provide inbound services in Macao. There are two types of awards, the “Star Merchant Award” and “Service Star Award. Each and every participating merchant who successfully passes the assessment will receive the “Star Merchant Award”, which will be valid for 2 years and to be displayed at the agency. To compliment travel agencies providing quality inbound and outbound services within and outside Macao, “Service Star Award - Inbound Service” and “Service Star Award - Outbound Service” are added, the “Star Merchant Award” winner with the highest total score and meets the prescribed standard in the respective area will receive a Trophy and a cash prize of MOP10,000 as a token of appreciation. The Scheme speaks for an authoritative recognition of excellent tourism service quality in Macao. Having received this prestigious accreditation, the industry players are not only able to prove that their quality service gives a pleasant experience to their customers, but also the opportunity to market their achievements with commitment to quality and hence building brand confidence and stakeholder trust. Application is free of charge. 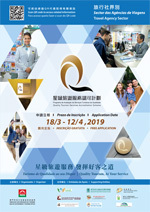 Application form can be downloaded from MGTO website http://industry.macaotourism.gov.mo and also available from the Training and Quality Management Department of Macao Government Tourism Office. Please submit the completed application form together with the necessary documents during office hours to the Training and Quality Management Department of Macao Government Tourism Office, located at Room 1821, 18th Floor, Hot Line Building, Alameda Dr. Carlos d'Assumpção, nos.335-341, Macao.